Hello,Lynne here from Adorn. I live in Scotland and stumbled into stamping via, of all things, cross-stitching, that was about 8 years ago. I have the privilege of being on DTs and enjoy submitting to Stampington & co publications where I have been published over a range of titles. 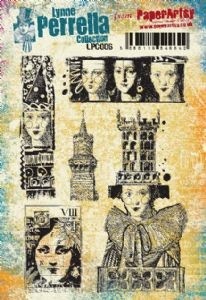 I am told I am recognized for a shabby chic/vintage style (I have a passion and large collection of photo real stamps). 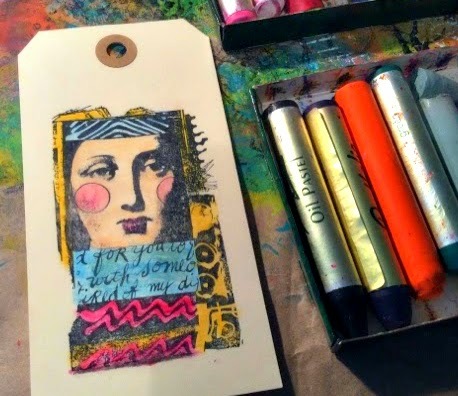 Stamps themselves inspire me and they provide such versatility from the surface we stamp onto to allowing us to embrace a range of styles and for the story teller within us to emerge and be displayed in our artwork. 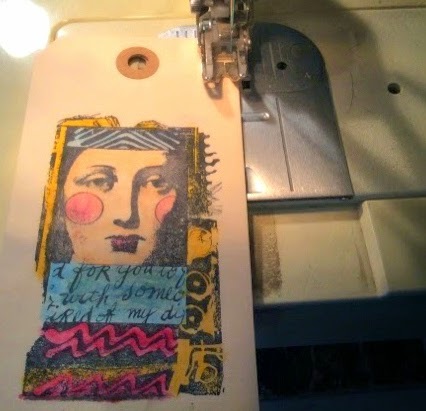 Stamping, aside from something I am passionate about, has allowed me to connect with like minded people, many who have become friends and has provided wonderful opportunities for me, such as being a Guest Designer for Paper Artsy. Tonight I am here to share with you a project featuring stamping into paperclay with these beautiful hearts from Sara Naumann. Creating the hearts is step one because drying time has to be taken into consideration. 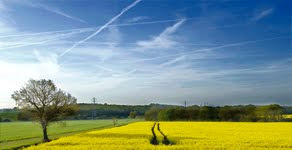 Factors such as heat, humidity in your home and also thickness/size of the clay vary the time required. Condition the Creative Paperclay in your hands then working on a craft mat roll out the clay, with an old rolling pin, to a depth of approximately 7 mm. 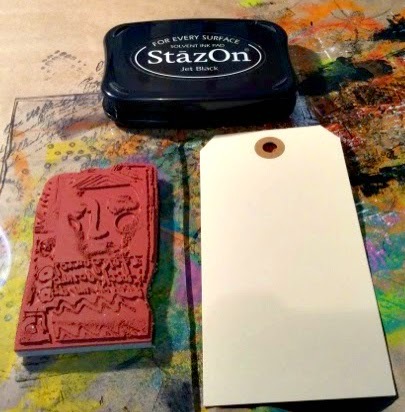 Stamp into the clay – there is no need to ink up the stamp, before gently lifting the stamp from the clay. 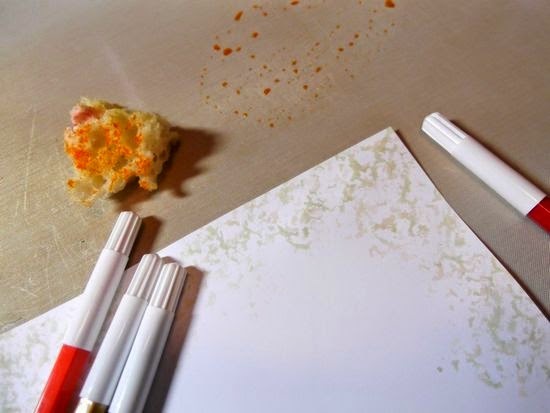 Immediately clean your stamp thoroughly. I used Eclectica Sara Naumann’s ESN11. Gently cut away excess clay with a craft knife so as not to distort the image. If you prefer you can leave this stage until the clay has dried. Transfer the hearts onto a flat, absorbent surface, I use kitchen paper towel. Now be patient and allow the clay to dry! Dry brush Fresco Finish Vintage Lace, Nougat, Irish Cream, Antarctic and London Night with a foam brush. 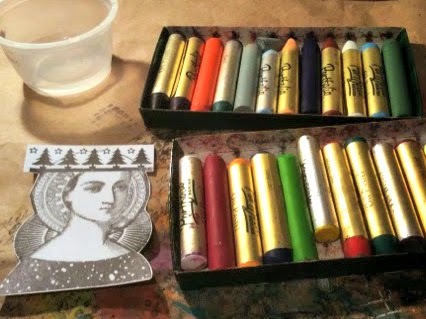 Now to prepare the 4”x4” box canvas by randomly applying the same Fresco Finish colours as used on the hearts. Apply with an old credit card and fingers and also apply touches of Grunge Paste. Remember to paint the sides of the canvas. Leave to dry. Stamp script several times onto white tissue paper with Staz-on Jet Black. Apply to canvas with Golden Soft Gel Matt Medium. 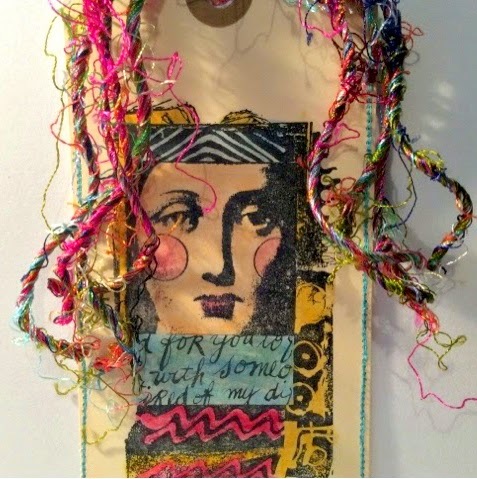 Once dry layer torn pieces of vintage lace applying with the same medium. 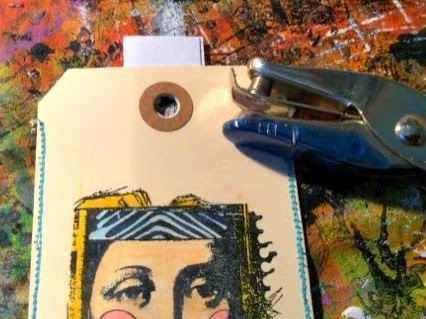 Wrap muslin around a vintage spool (or substitute for a new spool), adhering with Gel Medium. Leave to dry for a few moments before applying the Fresco Finish paints used throughout the project. Leave to dry. 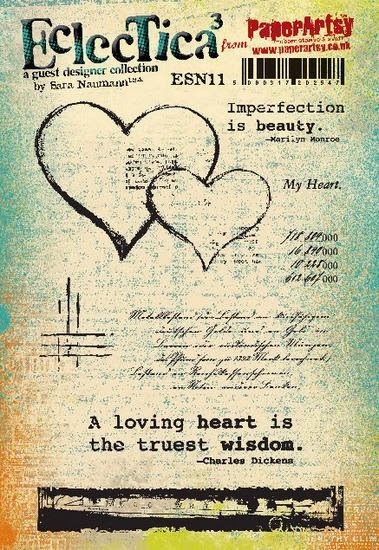 Stamp Marilyn Monroe quote with Staz-on Jet Black onto tissue paper. Adhere to the spool with Gel Medium. Leave to dry. 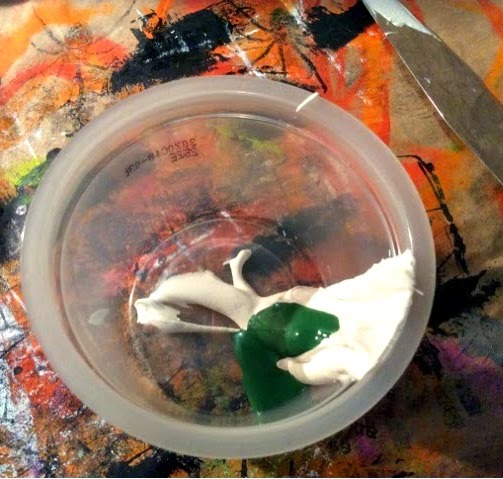 Adhere spool to the canvas with silicone glue. 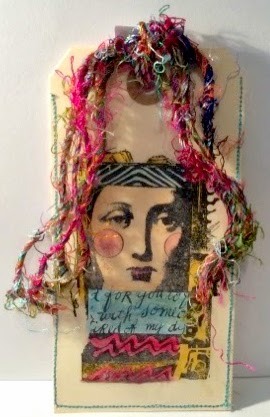 For the final touches paint lace rose ribbon with diluted Distress Paint Weathered Wood. 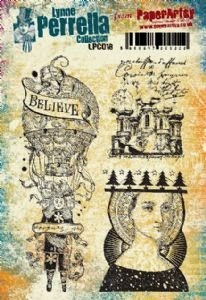 Adhere to top edge of the canvas, embellishing with an Idea-ology Curio. 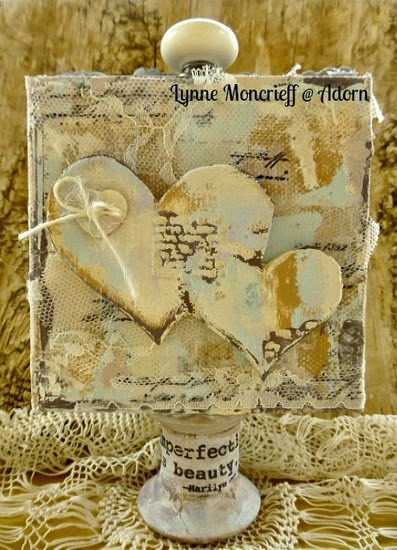 Embellish the paperclay hearts with a mother of pearl heart shape button threaded with ivory jute twine. 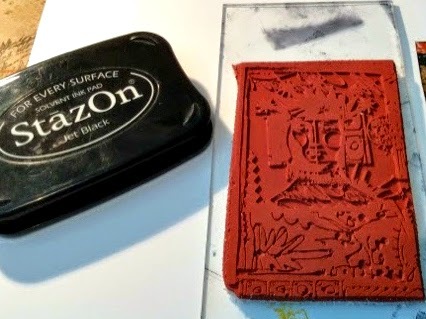 You can see that the detail on the stamp has transferred beautifully onto the clay. If you have never used paperclay before then I hope this will inspire you to have a play. Imagine the fun you will have as you look at your stamps in a new light. 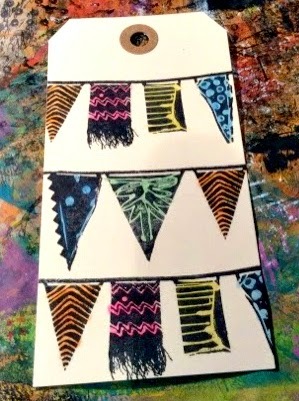 Thank You so much to PaperArtsy for inviting me to be a Guest Designer – this has been so much fun! A huge thanks to Lynne from all at PaperArtsy HQ. We are so pleased that you could join us, your previous published work is so inpsirational and tonight's project is just as beautiful. Delicately vintage with so much texture. 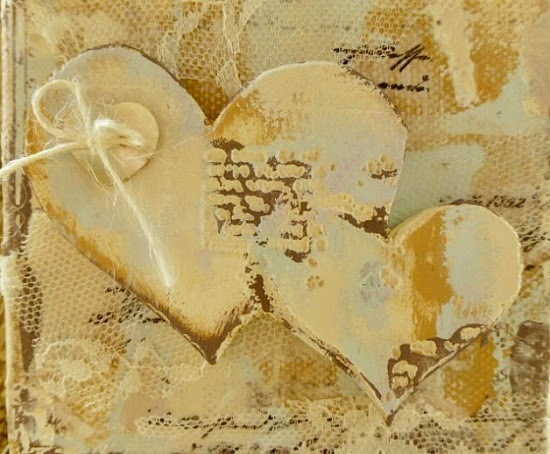 The paperclay hearts are gorgeous, I can see many of those being made. 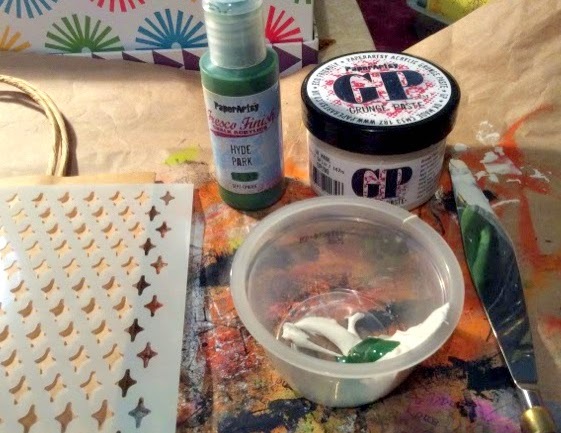 Hi, it’s Lesley here tonight and I was really pleased when Darcy asked if I’d like to do a Guest Blogger spot using fabulous PaperArtsy products. 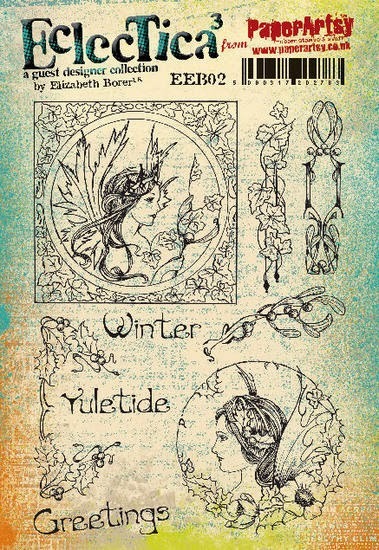 I decided to use Elizabeth Borer’s stamp sets EEB01 and EEB02 again because when I took part in their blog launch night I focussed mainly on the fairies and foliage stamps and this time I wanted to concentrate almost exclusively on the beautiful baubles. 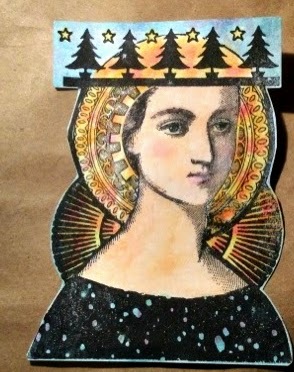 As few Christmas cards using Elizabeth’s stamps have been featured on the blog, I chose to make some for my contribution tonight. Whilst I love creating painty/inky layered and textured backgrounds using different media my current favourite card style is clean and elegant so I took inspiration from the elegant bauble stamps themselves together with Fibralo pens and matting and layering co-ordinating card, I wanted to show anyone new to rubber stamping and card making how easy, given beautifully designed stamps, it is to create a Christmas card that any none ‘arty’ recipient would love to display. All my cards feature the baubles stamped onto separate card, coloured directly with Fibralo pens and cut out then given a little dimension with either a bone folder or any round ended tool you have in your kit (mine is an acrylic tool that came from a wire working set). 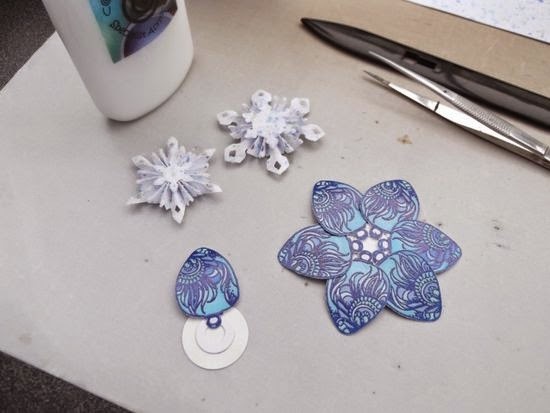 Card #1 had the long bauble from EEB01 stamped into a ‘flower’ design by masking some to give the illusion of dimension and then colouring before cutting out as a whole piece then adhering to the card top layer on the card base. 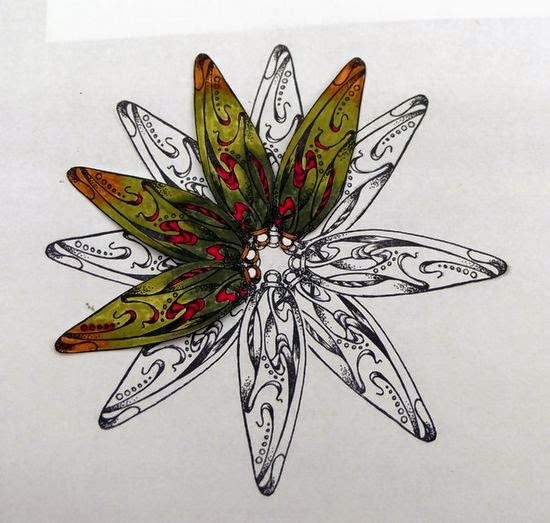 The photo below shows the original full ‘flower’ on a scrap mock up but I thought it was too much so I did less bauble layers and placed it to one side on the card and trimmed it down. I then stamped a few individual baubles, shaped them and layered them over the ‘flower’ with a little dimensional glue (silicone or Pinflair). I finished off with a metal flower, button and tiny bow and a sentiment from my stash (I don’t yet have any PaperArtsy Christmas sentiments in my stash ….…soon!). Card #2 had flowers created in a different way as you can see from the photo below. 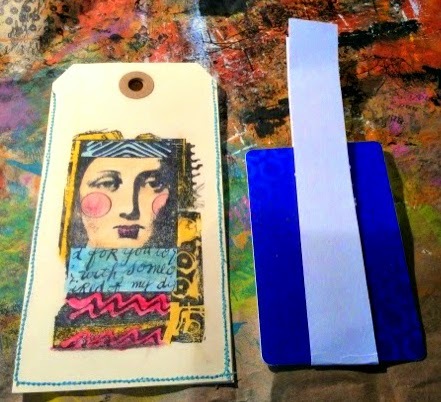 This time they were stamped and embossed with blue metallic embossing powder before colouring with Fibralos and I also created a co-ordinating card layer by scribbling the Fibralo colours onto my craft mat, spritzing with water and flicking the drops onto card from a paintbrush. I dried each colour before doing the next one so the colours stayed true. 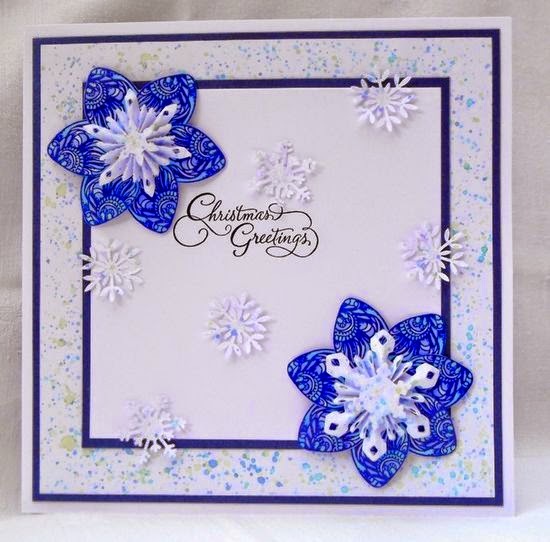 I used a full A4 piece of card for this so that I had enough to die cut the snowflakes and rosettes. I finished those off with dabbing ‘dries clear’ glue on with my finger and then dipping them (the snowflakes not my fingers ;D) into clear glitter. 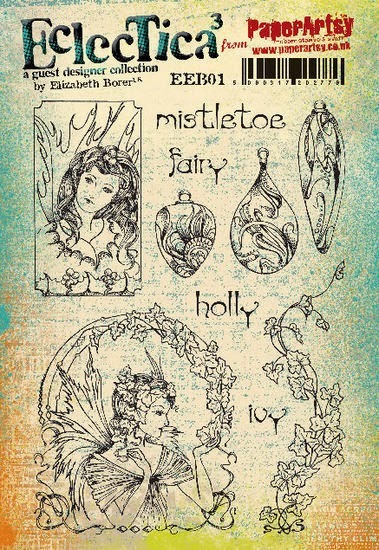 Card #3 uses the last of the three bauble stamps in the traditional way and I combined it with the lovely Art Deco mistletoe stamp from EEB02 to hang them from. 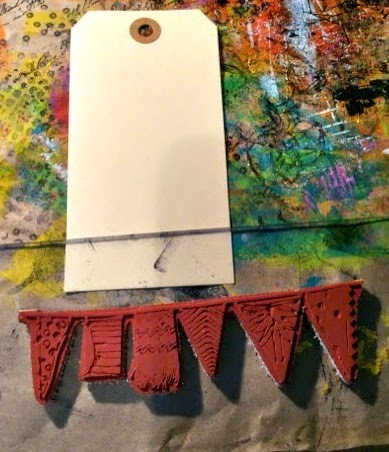 This time for the co-ordinating card mat I used the same method of scribbling Fibralos onto my craft mat as the previous card except instead of flicking with a paintbrush I applied it with a piece of textured natural sponge. So simple but I really like this effect. The mistletoe border was cut out and attached with 3D foam pads. Again the baubles were stamped, coloured, cut out and shaped before adhering to the top card layer with dimensional glue. I hope you like my cards and that they inspire you to create some of your own if you’re like me and you’re late getting started with your Christmas cards, lol! Thanks to Leandra and Darcy for the opportunity to appear on the blog again and if you would like more details of how I made these cards please drop by my blog later. A huge thanks to Lesley from all at PaperArtsy HQ. These cards are so beautiful, really elegant. 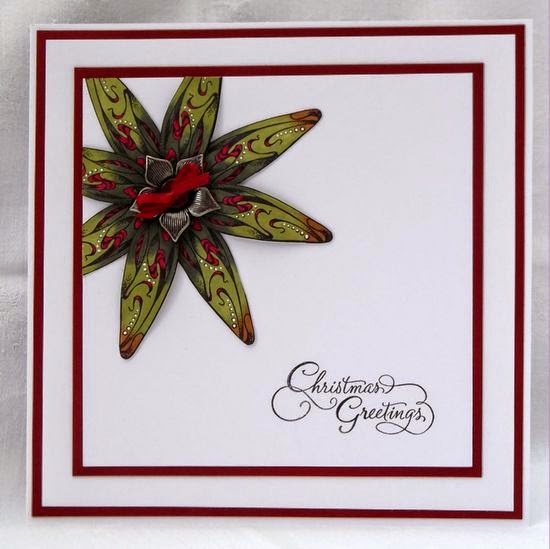 You have shown the stamps off perfectly with simple designs and striking colour choices. 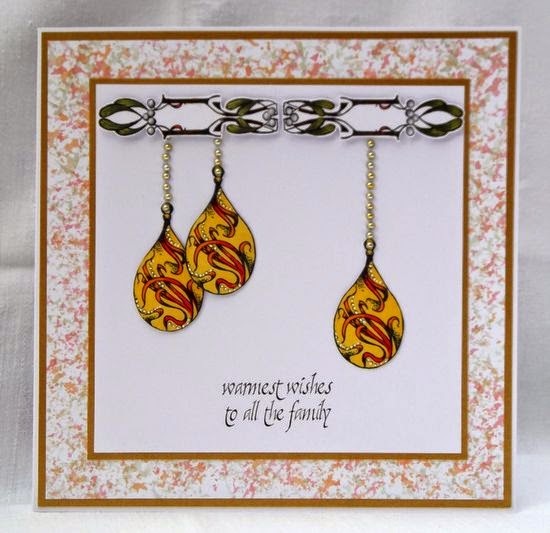 Your coordinating card is a wonderful compliment to the focal designs, the sponged Fibralos is a great technique. "Hello all, Lelainia here, glad you could all join me. I love to give small handmade gifts for the special people in my life. As I was working on this project, it occurred to me that it would be really fun to make a bunch of these and then leave them hanging on the front doors of my friends’ homes, secret Santa style. Imagine how lovely it would be to come home to find a Christmas cone fully of goodies waiting for you"! 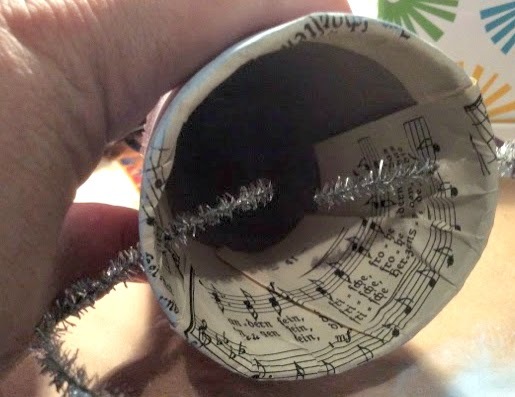 I began by digging up an old recycled thread cone I had saved to make a Christmas cone. 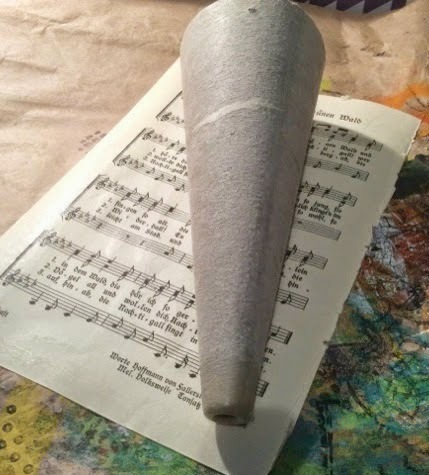 At this time of year, many craft stores carry pre-made paper cones or if you don’t have one, you can always just make your cone by twisting paper into a cone shape. 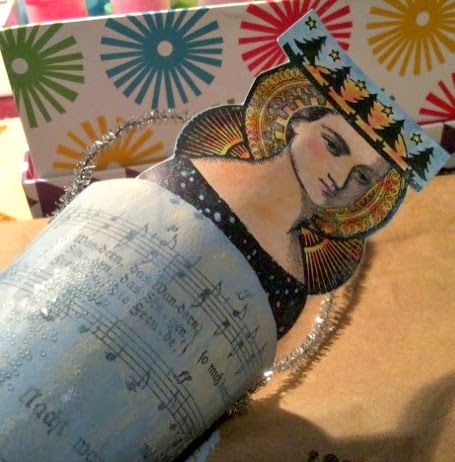 I would use the Smoothy Heavy Weight Stamping Card to do this so your cone will be strong. 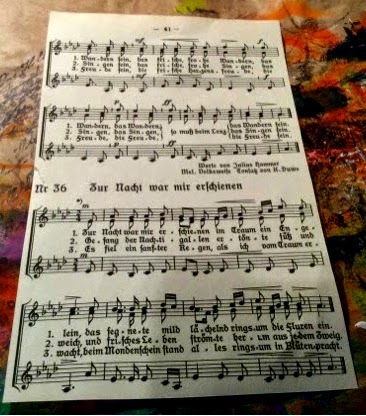 I covered the cone using two sheets of music from an old book. 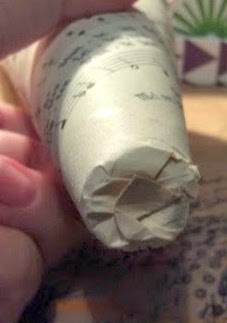 I covered one sheet in glue stick and then put it on a bit of a diagonal angle and wrapped it around the cone. I folded the leftover paper at the open end inward and smoothed it down. 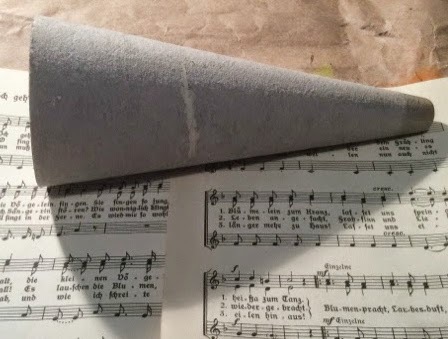 I trimmed off the margins of the second sheet (just to have less unprinted area) and then covered it in glue stick and used it to cover the remainder of the cone, folding the leftover paper into the opening again and smoothing it down. 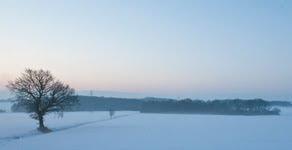 Next I covered the entire cone with a watered down coat of Ice Blue. I just wanted to add a bit of colour, but still be able to see the music paper through the paint. 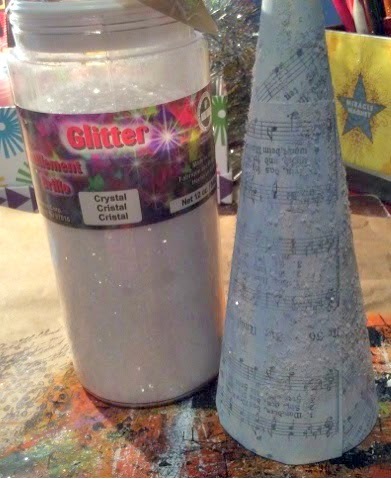 Once the paint was dry, I put glue stick all over the outside of the cone and then sprinkled crystal (clear) glitter all over it. I wanted it to have a snowy look. 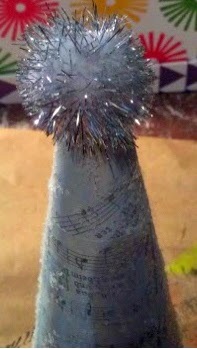 I used Aileen’s Tacky Glue to glue a small sliver and white glitter pompom to the pointy tip of the cone. I set the cone aside to dry. 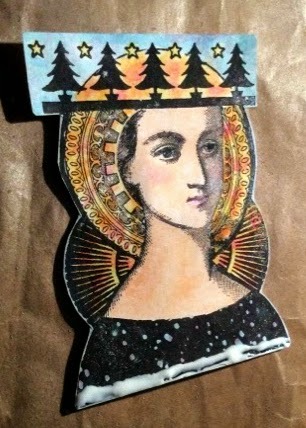 Next I stamped the angel with the tree crown from LPC018 with Black StazOn Ink onto Smoothy White Stamping Card. I cut the image out. I used my Portfolio Oil Pastels to paint the image, using a tiny brush and minimal water. 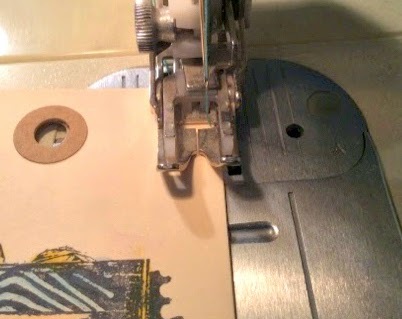 Using an awl, I poked a hole on either side of the opening of the cone at the top, about ¼ inch down from the rim. I threaded a silver pipe cleaner through the holes on both sides, from the outside, in. I twisted each end around the pipe cleaner to secure it as a handle for the cone. I applied a line of Aileen’s tacky glue along the bottom edge of the angle and glued her to the inside of the cone at the front. I held it in place until it was dry just to make sure it was going to stay put. 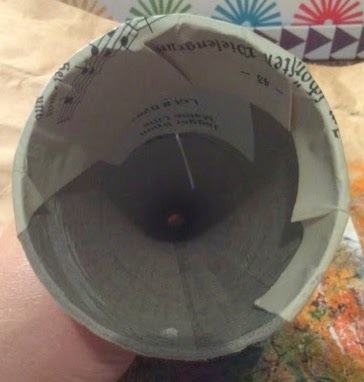 Once that was dry, I added a line of glue all the way around the outside of the cone lip at the top. 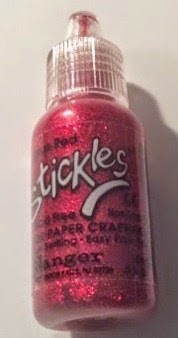 I ran a strip of silver tinsel around the top, starting and finishing at the back to hide the ends. I pressed it firmly into the glue strip to make sure it was adhered securely. Now that the cone is ready, I can fill it with some individually wrapped holiday sweets mmmm! A huge thanks from all the PA team Lelainia for sharing some quirky alternatives for the forthcoming holiday season, we sure all need as much help as we can at this time of year. We would love you to join in with our monthly challenge. If you are inspired by any of this month's guests who have blogged between Oct 1st 2014 and Oct 31st 2014 then join in and link up your creativity HERE. 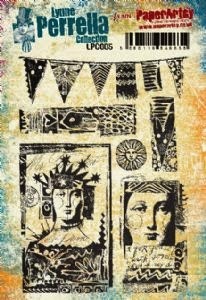 You will go in the draw to win a £50 voucher to spend on products of your choice from the PaperArtsy online store. You need to add your link by 19:00 (London time) Oct 31st 2014. "Hi Everyone, Lelainia here. During the holidays, it always seems like I am either running low on scotch tape or I have a gift that is just too oddly shaped to do a conventional wrap on. Whoever invented gift bags was brilliant; however I really prefer to buy plain ones and art them up to make them more personal than the dollar store variety". First I took some Grunge Paste and tinted it with a few drops of Hyde Park. I made sure I mixed it in really well. I lay my plain brown gift bag down flat and put the Mini Spinning Tops stencil down on top of it, centring it on the bag front. 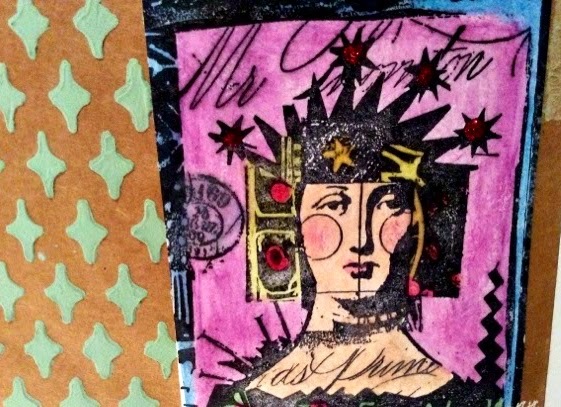 I gathered up a wad of the tinted Grunge Paste on my pallet knife and then scraped it over the stencil several times to get good coverage. 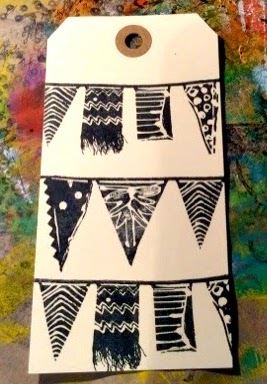 I scraped the excess away fairly firmly, so that there was just a thin layer of stencilling. 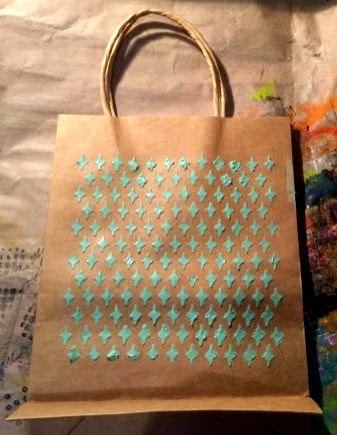 One thing I decided to differently next time is that I’d use bulldog clips to hold the stencil down securely on the bag. I think it’s just easier to have both hands free when swiping with the pallet knife. There’s also less of a chance the stencil will slip. 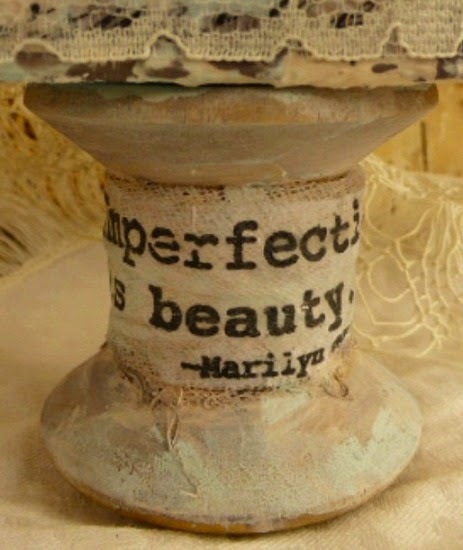 Once I was satisfied with the application of the grunge paste, I carefully removed the stencil and washed it and the pallet knife immediately. I set the bag aside to dry. Next I took the largest number 2 and 5 from a package of FinnabairVintage Trinkets and applied Ranger’s Xmas Red Stickles to the numbers. I set these aside to dry overnight. 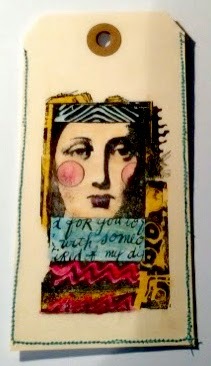 I stamped the large woman image from LPC005 onto Smoothy White Stamping Card using Black StazOn Ink. I added colour to the image, with Portfolio Water Soluble Oil Pastels. I use a small tipped paint brush, a Plaid #2 shader. I used a minimal amount of water on the brush and then swiped it against the pastel to pick up colour. I keep a paper towel nearby to remove excess water by dabbing the brush on it if the brush is a bit too wet. The less water you use, the more intense the colours will be. When I was finished, I cut the image out. I glued the image onto the bag with Aileen’s Tacky Glue. I opened up the bag and measured out a length of lace to wrap around the bag, just overlapping the bottom of the image and knotting it. 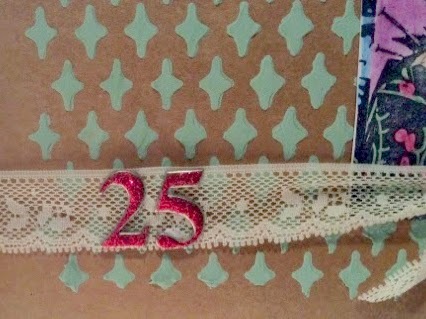 I glued the dried numbers to the lace. I lay the bag flat and pressed firmly on the numbers to make sure they were adhered securely. 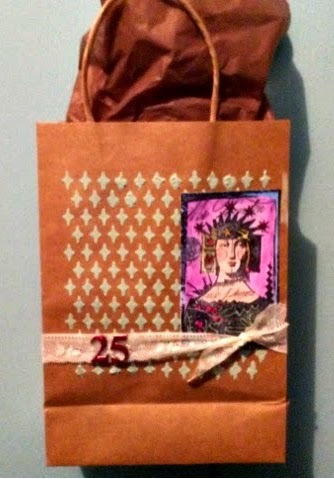 I got the bag ready to hold a gift by adding a piece of coordinating tissue paper inside. Now all I have to do is place my gift inside and it’s ready to go! 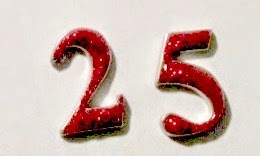 I will be back tomorrow evening with my final festive gift idea using the Lynne Perrella Collection, do join me then. A huge thanks from all at PA HQ. 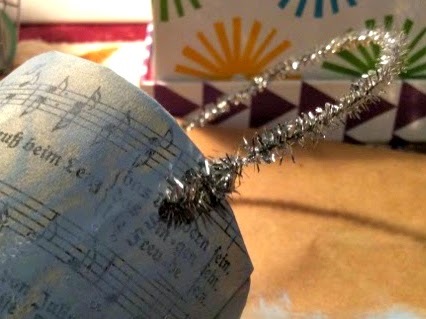 We all need that last minute gift packaging solution and this project is perfect. Incorporating that particular LP image with the stars and the use of the Mini Spinning Top Stencil lends itself well to the whole festive theme, thanks Lelainia! "Hi everyone Lelainia here! 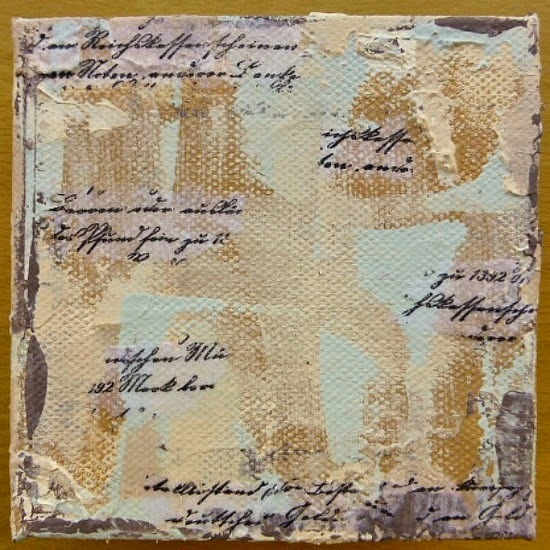 So excited to be working with Lynne Perrella images this month! I have been thinking about the holidays which are rolling up on us quickly. I wanted to help give you a jump start on preparing, so the projects I’ll be sharing this month will reflect that. My first project is a quick and easy one which lends itself well to giving small gifts, but making the presentation extra special". 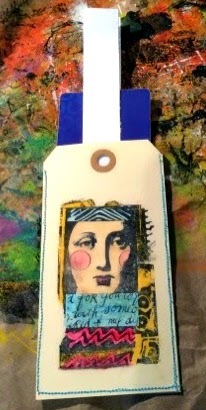 I began by stamping the smaller face image from the LPC006 on a Size 6 Manila Tag with Black StazOn Ink. 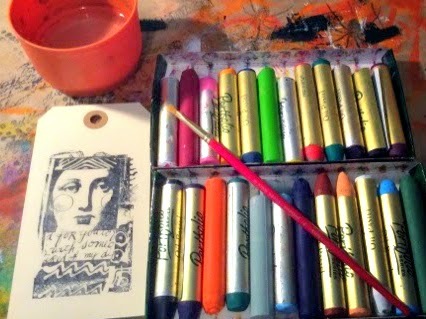 To add colour to the image, I pulled out my trusty Portfolio Water Soluble Oil Pastels. I use a simple trick to control where the colour goes when working on small pieces: I use a small tipped paint brush (in this case, a Plaid #2 shader) dipped in water to paint the colours on. I put a minimal amount of water on the brush and then swipe it against the pastel to pick up colour. I keep a paper towel nearby to remove excess water by dabbing the brush on it if the brush is a bit too wet. The less water you use, the more intense the colours will be. While that tag was drying, I took a second Size 6 Manila Tag and stamped the flag image onto it. I repeated the image 3 times working my way down the tag. I let some of the image bleed off the sides-I never like anything to look too perfect. I painted the designs on the flags using my shader paint brush and the Portfolio Oil Pastels. Next, I put the two tags back to back, blank sides together and I straight stitched around them on 3 sides, leaving the top open. I used a very scant 1/8 inch seam allowance to make sure that there would be enough room for a gift card to fit inside. I started stitching on the right hand side, just below where the corner is angled. I went around the 3 sides twice, just to make the stitching stand out and I was purposely messy about it. For the next step, I cut a strip of cardstock 1 inch x 11inches and folded it in half lengthwise. I put the gift card between the fold. This strip is going to allow the gift card to be easily removed when the recipient opens it. I slid the gift card with the strip around it into the tag pocket and then centred the top of the strip so it showed in the tag hole. I used my hole punch to punch a hole through the strip. Finally, I cut a piece of sari silk fibres 48 inches long and folded it into 4. I chose sari silk because I thought it would go nicely with the prayer flags on the reverse, but also because they are so colourful. You can use any fibres or ribbons you have on hand. I threaded the sari silk through the holes and tied a knot. Join me again tomorrow evening when I will have another project to share with you all. A huge thank you from the PA team for sharing this alternative gift idea for the upcoming holiday season. 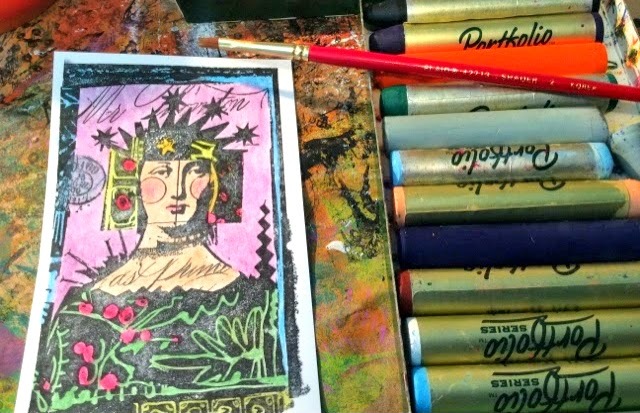 Love the vivid depth that you have achieved using the Oil Pastels. The colours from the Sahri ribbon match perfectly with the focal image.